What a match at Nagpur – another Indian victory – another time a score of 350 chased successfully……… feeling elated after the great innings of Dhawan and Kohli.. there were real fire works at Nagpur ~ it ended up to a delightful day for the spectators with 701 runs scored for the loss of just 10 wickets…. 4 hundreds – Kohli, Dhawan, Watson and Bailey topping with 156….. But is the game becoming predictable and more batsman oriented ? – Mitchell Johnson kept hitting the deck bowling close to 150 kmph and took 2 wickets in quick succession troubling Suresh Raina and Yuvraj…….. but Kohli was a class apart scoring another ton – another faster one – another one in chase … deserves lots of accolades……………… but from successfully defending 220+, now teams struggle to defend 350 + …………. What sort of transformation this..the poor bowlers are just a side dish. Whatever a 2 – 2 – 2 Series [Ind – Aussie – Rain] and Bangalore is most exciting.. Virat Kohli now has 11 hundreds in 69 chases; Push the boundaries, shift the goalposts, change vocabularies. The enormity of Three hundred and fifty no longer inspires awe ~ and for such a tall chase, teams do not panic and no slogging at all…. Dhoni walks in is beaten, shoulders arm to one………… yet victory is achieved with 3 balls to spare. 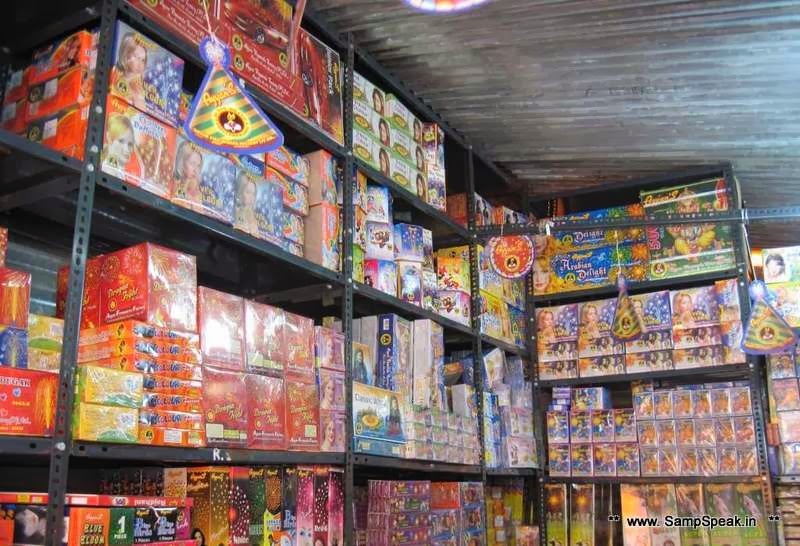 celebrating Deepavali with Crackers..... shops at Island grounds..
Deepavali, the festival of Lights enthuses everyone and is celebrated all over the Country with great enthusiasm. People wear new clothes, eat and share lot of sweets and celebrate with crackers. The very thought of Deepavali celebrations pervades happiness and would enthuse us ~ the fervour felt right from our childhood. It is a grand festival that would provide everything in abundance – sweets, visiting and sharing with friends and relatives, watching movies and more…. In Chennai, the Island ground is bustling with activity now…. ‘Island’ in Chennai ? ~ there are no flowing rivers in the city – the Coovum winds its way to the Bay of Bengal and nearer Napier bridge – between Beach road and Mount road lies this island – a vast empty space where fairs and exhibitions are held. For ages the crowded Parrys would get more congested as Bunder Street, Badrian Street, Anderson Street all will look similar – only shops selling crackers. 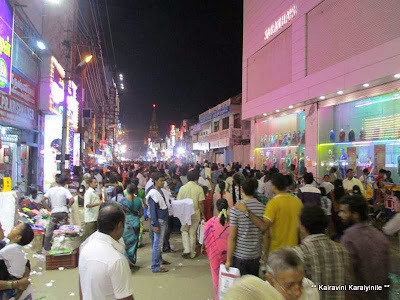 All roads would lead to shops selling fire crackers of various manufacturers including – Standard, National, Sri Kaliswari, Ayyan ….. – you can see hundreds of shops - still all do roaring business. Somehow one gets a feeling that there have been attempts to somehow dampen the spirits of Deepavali – as every year, we hear of more and more restrictions from various Governmental authorities. Earlier, some hue and cry was raised about child labour in the fire works manufacturing – it the concern was real, why the same was not raised in candle manufacturing and other things – where also child labour is involved. Then, talk about the pollution control. Tamil Nadu Pollution Control Board (TNPCB) has issued guidelines to ensure that high-decibel firecrackers do not cause trouble to the public. Then there is the Supreme Court guidelines, which bans bursting crackers between 10pm and 6am. Can any of these authorities think of a similar ban on say – sale of liquor, at least restricting the timing or say screening of cinema etc., In 1987 the Montreal Protocol, an international environmental agreement, established requirements that began the worldwide phaseout of ozone-depleting CFCs (chlorofluorocarbons). These requirements were later modified, leading to the phaseout in 1996 of CFC production in all developed nations. In 1992 the Montreal Protocol was amended to establish a schedule for the phaseout of HCFCs (hydrochlorofluorocarbons). HCFCs are less damaging to the ozone layer than CFCs, but still contain ozone-destroying chlorine. US and other European Nations would want all third World countries to stop using all comforts but they themselves would do little. Back home, those who talk loud of noise pollution and other pollution – would do precious little themselves. Would people stop using Refrigerators, Air conditioners at home…. Would people at least start travelling by ordinary cars avoiding AC in car ? - no but pollution is bad !!!! Over the past couple of years, traders in Parrys as also in other residential areas have been hit by the Court order prohibiting sale in such areas. 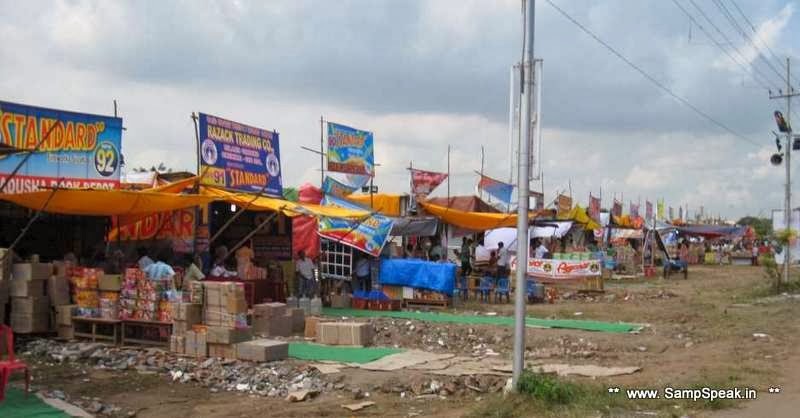 The Court had directed that all wholesale and retail traders should sell firecrackers at specified places ~ this year also temporary structures have been erected at Island Grounds and a few more at YMCA, Royapettah. It is contended that cracker shops should not be allowed in the narrow lanes and bylanes of Flower bazaar and hence shifted to a safer area – Island grounds. Though there have been similar pleas in earlier years, last year was the first when permission was not granted by Police. With no other option available, the cracker dealers had to confine themselves to narrow strips in Island Grounds –the entrance is near War memorial and the place for parking is not all that laid out. The shops are arranged in Blocks in rows and sales are picking up. The prices of crackers have been going up every year and this year too, they have increased. 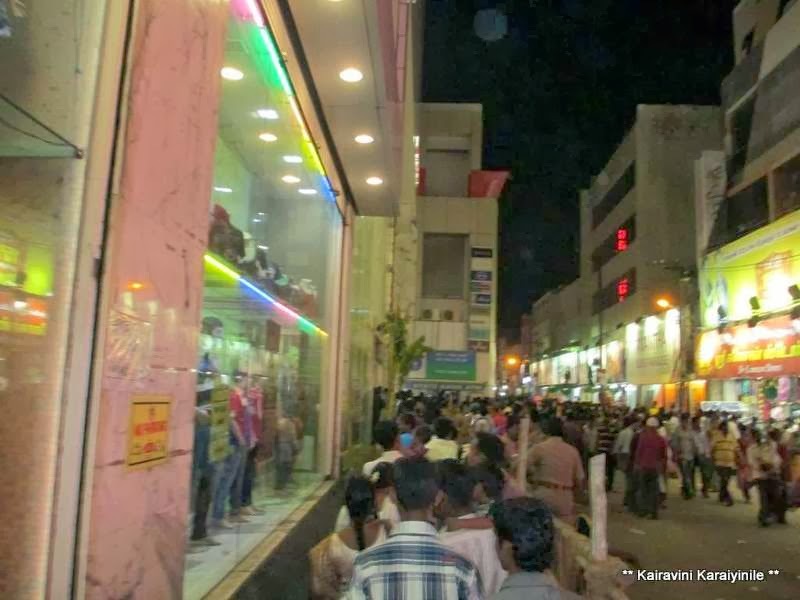 It is for sure that the spiralling prices have not dampened the spirit of people - people are too willing and raring to purchase crackers and alight the sky with flower pots and dazzling ones. Newspaper reports suggest that on Saturday, fire service personnel demonstrated the use of extinguishers and explained precautions to be taken, to the dealers at Island Grounds. Tamil Nadu Fire and Rescue Services (TNFRS) has approved of 800 cracker shops, including the 120 shops at the Grounds. It is stated that each shop has been allowed to store 100 kg of firecrackers. Earlier, three plastic surgeons from Government Kilpauk Medical College Hospital, visited seven city schools — Corporation-run and private — to teach students preventive measures. That shows the preparedness and planning of the authorities. Come, experience the pleasure of shopping and celebrate Deepavali with fireworks. Have you purchased crackers………….. in everything I purchase, I have the habit of buying from the same person / same company – make deal only with those who are pleasant and ensure that you remain cheerful and pleasant to them also…. After all, life is all about exchanging pleasantries and remaining happy – no point in fighting for petty things and losing our balance and mental peace. 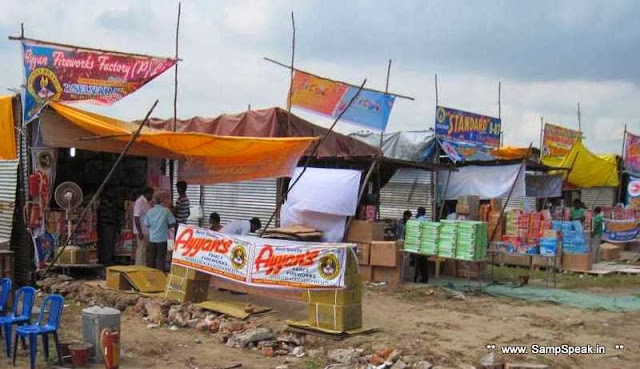 This year too, I bought ‘Bunny brand’ – Ayyan fireworks – from Best Crackers Centre at Theevu Thidal A Bloc shop……….. I have been their regular customer for decades at their 23 Anderson Street shop. It sure gave me happiness when the owner greeted me with a big smile and gave a small discount too. Wishing you all Happy and Safe Deepavali 2013. The Nishada Kingdom was the kingdom of the Nishada Tribe, a tribe of people who the Vedic people considered valour and courageous. Back to International cricket, fans are expecting that there would be no further rains and it would only rain fours and sixers at Nagpur…. It is going to be at the new Jamtha stadium which could be another batsman’s paradise. Rain has ensured that Aussies could not become no. 1 in ranking but India needs another victory to stay alive in the home series – India has lost more ODI series at home to Australia. Nagpur – is called city of Oranges. This major commercial and political centre of Vidarbha region is famous for oranges. Nagpur lies precisely at the center of the country with the Zero Mile Marker indicating the geographical center of India Citrus Sinensis is commonly grown tree fruit. Vidarbha is the eastern region of Maharashtra state. Its former name is Berar (Varhad in Marathi). Vidarbha holds two-thirds of Maharashtra's mineral resources, three quarters of its Forest Resources. In recent times, there have been calls for a separate state of Vidarbha, due to perceived neglect from the Government of Maharashtra and incompetent political leadership in Vidarbha. The match is to be played at the Vidarbha Cricket Association Stadium (also New VCA stadium), a Test cricket ground built in 2008. VCA Stadium is the home ground for the Vidharba and Central Zone teams for the domestic Ranji Trophy and Duleep Trophy tournaments, respectively. The stadium is located in the Jamtha neighborhood, about 15 km from Nagpur. Spread over 33 acres (130,000 m2), VCA Stadium features include, Ultra modern media box, gym for players, VIP and Corporate boxes, wi-fi coverage and a capacity of 45,000. The stadium has four stands. The East and West stands are open to air stands with two tiers. There has been news of impediments – ToI reported that Vidarbha Cricket Association has been asked to obtain state government's permission before proceeding with online ticket sale of the India-Australia ODI at Jamtha stadium on October 30. The VCA was also in the dock for not complying with the requisite fire safety norms at the stadium as the authorities had not obtained a no objection certificate from the Nagpur Municipal Corporation's fire and emergency services department. Nagpur Municipal Corporation (NMC) fire and emergency services department had, since October 7, refused to give NOC for the match, pending compliance with fire safety norms at the Jamtha stadium. The VCA has already organized 22 matches, including 11 international, three IPL and eight of Challenger Trophy, without a full-proof fire safety system at the international-level stadium. However, now it has been forced to ensure temporary fire preventive and safety mechanisms before it is allowed to host the October 30 match. TOI further reported that VCA submitted an undertaking along with Rs 50 lakh bank guarantee and plan of temporary fire safety mechanisms being installed at the stadium. VCA promised to install permanent fire preventive and safety systems at the stadium within six months. The option of making temporary arrangements was given to VCA when it said that the permanent fire safety system could not be installed before the match. Once the Online sale was approved, Cricket fans thronged the website as soon as online tickets sales started on www.bookmyshow.com. Some managed to book tickets but many faced a lot of inconvenience. Anyone trying to book a ticket was shown the message, "All seats are currently in transaction process, please try again after sometime", for hours together. If you move away from Cricket to the other important C ‘Cotton”, the cotton growers in Vidarbha region have been under duress for too long. Recent reports suggested that meagre compensation amounts of Rs 80 and Rs 100 are being given though the Chief Minister had announced a Rs.2,000 crore aid package for the flood-hit regions. The Hindu reported of a farmer from Wardha district in the Vidarbha region of Maharashtra, who suffered losses of around Rs.15, 000 during the last monsoon floods, being aghast to receive a compensation amount of Rs.80. According to NGO Vidarbha Jan Andolan Samiti (VJAS) chief Kishore Tiwari, “Thousands of cheques bearing compensation amounts like Rs.80, Rs.100, and Rs.150 are lying in various tehsildar offices, but the farmers are refusing to collect them,” ~ it further states that “The most shocking part is that some officials came to survey his premises, they had tea and snacks in his home and even took Rs.100 promising to expedite his claims. VJAS demands that these officials be suspended and booked.” The meagre compensation amounts are being doled out though Chief Minister Prithviraj Chavan had announced a total aid package of Rs.2,000 crore for the severely flood-hit regions of eastern Maharashtra during the monsoon fury this year. Several districts of the Vidarbha region, especially Wardha, Amravati, Yavatmal, were severely affected by deluge during this year’s monsoon in July-August. It is indeed sad to read of the plight of the farmers. Ekalavya was a king of a Nishada tribe. Nishadha was the kingdom of the celebrated king Nala Chakravarthi, who loved and married Damayanti the princess ofVidarbha Kingdom. Nala is known for his undeterred commitment to the path of righteousness even under duress. This kingdom is identified with current day Gwalior district of Madhya Pradesh. Chennai city bustling with traffic is chocking more…… as the festivities of Deepavali is reaching its feverish peak………. Roads leading to T Nagar, Purasawakkam, Vannaraperttai are all filled with humans … there is no place to walk even, leave alone going by transportation. In most places, traffic is regulated, made one-way and auto-rickshaws not allowed to ply… as more people rush towards shops. From crazy shopping to focussed textile purchases – people are on spending spree – you spot everyone moving with few more bags and lot of glee in their faces………… as the festival approaches, this week end became hectic and everyone seemed to be on the roads, heading for shops for buying more. At every important traffic junction, crossing was laboriously difficult as pedestrians vied with vehicles inching towards their marked destinations. To many families, it was last-minute shopping……. Gone are the days when one would buy a set of dress, head to the regular tailor and wait anxiously for him to deliver – sometimes promised at the proverbial 11th hour – the night of Deepavali, which we assumed to be around 9 to 10 pm but for the tailor literally 3 0r 4 am – the next day – the Deepavali day…… now – people buy more sets and mostly readymade garments. ~ to the shop owners and traders - no doubt the milling crowds usher in happy atmosphere and brings joy filling their coffers. 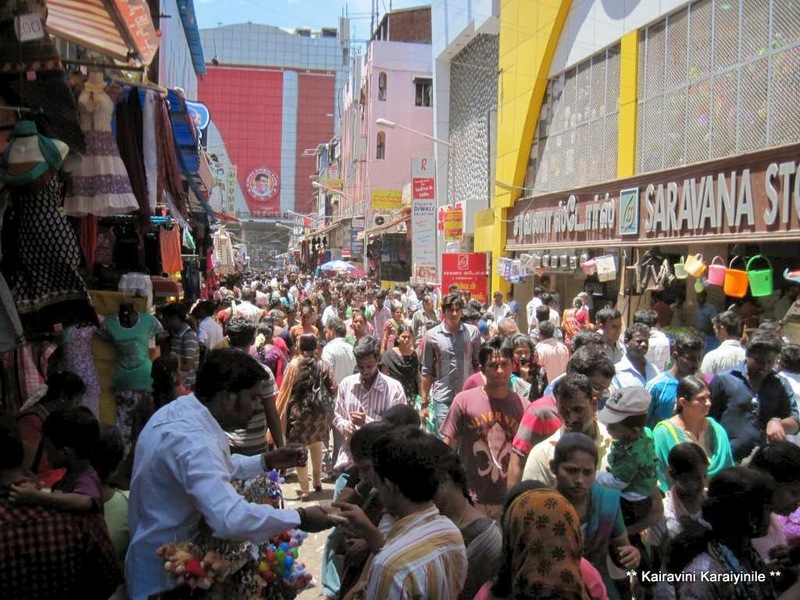 Anticipating huge crowds, traffic changes were made in the shopping districts- it is really a great market – with people on spending spree – it is good for traders not only of textiles – but for autowallahs and other transporters – hotels and eateries doing great business – gift shops and Gold shops too having field days. There are two bus stands in Tiruchirappalli city; the one which connects the town to the rest of the places of Tamilnadu is the Central bus stand…. And there is the old Sathiram [Chathiram bus stand] where city bus services are run. Closer here is the most famous ‘Rockfort temple’. The Tiruchirapalli Rock Fort is a historic fort and temple complex built on an ancient rock. The 83-metre rock fort situated in the center of town is a major landmark in the town of Tiruchirapalli and is visible from a long distance. This is also a major tourist spot. During the early part of 16th century, the region came under the control of Madurai Nayaks, who were the earlier governors of Vijayanagara Empire. The Nayaks of Madurai constructed the Rock Fort Temple Lake. Atop the rock stands the majestic temple dedicated to Lord Ganesha, known as ‘Uchi Pillaiyar temple’ – the temple of Vinayaka at the top. The temple is mystic in its nature with an awe-inspiring rock architecture. The Ganesh temple is much smaller with an access through steep steps carved on the rock and provides a stunning view of Trichy, Srirangam and the rivers Kaveri and Kollidam. Due to its ancient and impressive architecture created by the Pallavas, the temple is maintained by the Archaeological department of India. The temple legend associates it with Vibhishana, was the younger brother of the Asura King Ravana. The roads that lead to the temple is a great market area bustling with activity all the time and uncontrolled crowds now during Deepavali…. 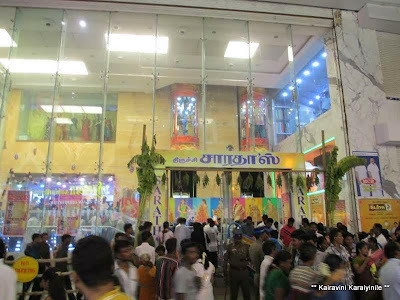 Again, the crowds of Trichy appear to be far different than Chennai – at Chennai people are lavish in their spending and money flow is quite high… ~ and here lies another landmark … the ‘Saradhas’ – of course there are other shops like ‘Anandhas’…. ::: ‘Saradhas’ – Chennai 2 – Trichy 2 used to blare the advertisement in radio……………… some state that mesmerising in variety, attractive in designs, appealing in colours, aesthetic in finish and above all affordable in price is the unique proposition of the shop. Situated in the busiest NSB Road in Trichy its name is thought to be synonymous with quality and service by the locals. On Sunday waded through the crowds at the busy bazaar – joined the crowds, stood in the Queue – went inside that famous shop and did a small shopping……………….. with some difficulty returned to the bus stand, moving to Central bus stand and thence to Trichy junction for the train journey back home. 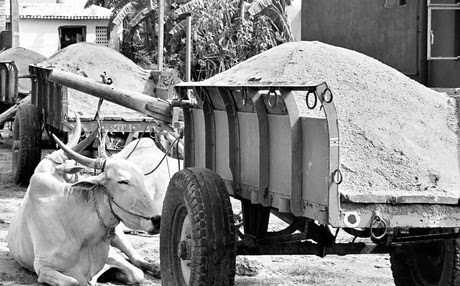 rampant illegal sand-mining and bullock carts arrested ..... !!!! This newsitem in NewIndianExpress made an interesting reading… it as one of law enforcement – right outrightly… but then why did it make an interesting read >!>? ~ when you pass by a river, you may not find water….but for sure would find busy transportation of tractor trailers and lorries…. They would be carrying sand – more specifically river sand for construction activities. Sand mining is the method of extracting sand – from dunes, dredged beds of water bodies….as the Society develops, more buildings are constructed …. leading to a demand for low-cost sand. Another reason for sand mining is for the extraction of minerals such as rutile, ilmenite and zircon, which contain the industrially useful elements titanium and zirconium. Sand mining causes erosion and also impacts the local wildlife; many a times it is done illegally. Today’s NewIndpress reports that at least three bullock carts with sand were seized in Kanai hamlet near Villupuram, in a crackdown on sand smugglers, after Express reported that a ban on mining in the district had failed to curb illegal sand mining. Police said the persons who were riding the bullock carts were also detained. “The bullock carts would be released after a fine is paid. If they are found engaging in sand smuggling again, legal action would be taken against them,” the SI of Kanai police station said. Express, had reported on Saturday that although a ban has been in force since October 13, many bullock carts were seen transporting loads of sand in the heart of the town. The district authorities, in a bid to control sand mining, temporarily banned all such mining activities and issued instructions for all earthmovers and tipper lorries to be removed from sand mining yards. In the recent decades, environmentalists have been crying hoarse on the possible change in ecological impact arising out of the indiscriminate mining of sand in the river basins, coastal areas and hill regions of Tamil Nadu. The threat to the livelihoods of local communities from this mindless commercial activity seems to be more real now than ever before. The Campaign for the Protection of Water Resources-Tamil Nadu has identified 15 adverse consequences of sand mining which include : depletion of groundwater; lesser availability of water for industrial, agricultural and drinking purposes; destruction of agricultural land; loss of employment to farm workers; threat to livelihoods; human rights violations; and damage to roads and bridges. There has been a significant increase in sand mining since the beginning of the 1990s following a boom in the construction industry, and the activity reached alarming proportions in several areas. Isolated attempts by local communities to seek legal remedies did succeed to some extent, with courts issuing directions to the State government to regulate sand mining under the provisions of the law. The Campaign presented a background note before the Court providing vital information on the Palar river basin. The Palar is the longest of the rivers in the districts bordering Chennai and has been a major source of drinking water for the State capital and its suburbs. Until a century ago Palar and its tributaries, were perennial rivers, but now the water flow is confined to the monsoon months. Because of this and also the thick layer of clay in the riverbed, the possibility of flooding has become minimal. This has attracted sand miners. Last month, the Tamil Nadu Government suspended sand mining on the beaches of the state. The Government ordered a probe into operations of 71 large quarries. Chief Minister Ms. J Jayalalithaa issued an order suspending operation of these quarries till the probe is over. The order was issued immediately after receiving a report submitted by a special team led by revenue secretary Gagandeep Singh Bedi, which probed into indiscriminate mineral mining in six lease areas in the southern district of Tuticorin. These quarries are engaged in mining sand and major minerals such as ilmenite, rutile and garnet. Today’s Express also reports of Sand mafia allegedly trying to kill the tahsildar of Alangudi when he tried to intercept illegal sand-laden vehicles; later the driver of a tractor was arrested and the vehicle seized. According to the report, K Govindarajan, tahsildar of Alangudi and other revenue authorities were conducting vehicle checks at Keelathur near Alangudi following a tip-off when they tried to intercept two tractors loaded with sand. The drivers of the tractors did stop their vehicles and moved ahead, knocking down tahsildar on the road. Subsequently, the revenue authorities chased and seized the tractor, which knocked down the tahsildar. The other vehicle managed to escape. Going by an earlier report in Times of India, the illegal mining is rampant. The quarries are under government control and outside involvement is limited to getting contractors to dig up sand at a pre-determined rate of Rs 220 per truck load. So, close to five dozen quarries mined about 8,300 truck loads per day in TN in the last financial year would put a figure of 188 crores as revenue to State Government while contractors are estimated to have made about Rs 15,000 crore. The report stated that if there is a trade as fetching as the monopoly retail sale of liquor in the state, it is managing and operating licensed sand quarries of the public works department (PWD). TOI opines that though the state has control over sand quarries, it has not been able to stop illegal mining by contractors. While it has fixed 220 per truck load (400 cft) as fees for their services, enforcement is lacking. They fleece truck owners, who in turn fleece consumers. Sand prices will stabilize only if government deploys more people to manage sand quarries. Elsewhere the National Green Tribunal (NGT) directed the Deputy Commissionerand SP of Faridabad as well as Gautam Budh Nagar to ensure no illegal mining of sand takes place from land belonging to IAF in Faridabad. The Bench instructed taking of effective steps to ensure that there is no illegal sand mining. The bench was hearing a petition filed by NGO, Noida Lok Manch, which has alleged illegal sand mining is going on in IAF land- an air bombing and firing range -at Tilpat in Faridabad district of Haryana with the authorities doing nothing to prevent it despite complaints from villagers. The over 4600 acres of Air Force land, which has seen no activity over the last 25-30 years, is situated on either side of river Yamuna and mining there is affecting farming activities of the villagers living nearby, the petition said. It said removal of sand from the site in question is not only affecting farming activity but also causing lowering of the water table of the area. The petition also raised the issue of change in flow of the river if the mining is allowed to continue. First of October 2005 - It was otherwise normal Saturday morning, but for rail enthusiasts it was a day with difference. For one could see on track, their dreamgirl ! (rather old lady). The refurbished Fairy Queen was put to track test upto a suburban station called villivakkam. . This was a sort of a landmark overhaul – akin to an Open Heart Surgery, since all the 120 0dd boiler tubes made of copper were replaced with new ones. Whoever said that queens have soft hearts should see the hard hearted – nay, copper hearted queen. The Fairy Queen, a 2-2-2WT BG loco, is one of the oldest working steam locomotives in the world, dating from 1855. It was built by Kitson & Co. in January 1855 and supplied to the East India Railway Company, and began working in August 1855 as EIR #22. It was withdrawn from service in 1909 and preserved, and later moved to the National Rail Museum at New Delhi, where it was "revived" in 1996, and in 1997 it began regularly hauling a tourist train between Delhi and Alwar. The Fairy Queen is believed to be the oldest steam loco in the world that is in regular revenue-earning service now. There are a couple of locos that are even older that have been restored to working order, but they have been steamed only for special occasions (The Lion (1838) in the UK, steamed in 1930 and restored in the 1950's and steamed a few times since then; and John Bull at the Smithsonian in the USA, also of the 1830's, restored a couple of times over the years and steamed a few times in recent years). The legend has it that once (recently) a high ranking dignitary from the British High Commission offered to buy the loco for 30 mn pounds for the York Museum? But the Government politely turned down the offer. Monsoon is active and it rains often now a days…. Chennaites are sulking – they are not prepared for this too.. … heavy rain battered the city and some roads were found water logged chocking the traffic ~ pedestrians and two wheeler riders were the worst affected. It may be a stray incident but the so known posh Khader Nawaz Khan Road in Nungambakkam caved in after the rains, forming a six-ft deep pit. Around 9am, the asphalt caved in, said onlookers. Corporation officials said an underground sewage leak had created a cavity beneath the road. A senior corporation official who inspected the site said, “The sewage pipe running beneath the road had small holes through which sewage has been leaking for years.” The sewage mixed with the sand, dissolving it. Over time, the clayey soil lost its consistency. “Every time it rained, water seeped in and washed away the sand, which led to the formation of a cavern beneath the road,” he said. The rain probably caused collapse. Corporation officials said the road was laid three years ago and had not been inspected. After Monday’s surprise, the corporation plans to check other roads in the city. Other officials said that private players had dug up the road without permission and had not re-laid it as per corporation standards. ~ and one thought what would happen if there were to be too heavy downpours … in schools we have read that at Chirapunjee [Cherrapunji] it rains all the time and is the place which receives maximum rainfall in the World. Cherrapunji is a town in the East Khasi Hills in Meghalaya. It is the traditional capital of a hima (Khasi tribal chieftainship constituting a petty state) known as Sohra or Churra. Cherrapunji is located at 25.30°N 91.70°E. It has an average elevation of 1,484 metres (4,869 ft) and sits on a plateau in the southern part of the Khasi Hills, facing the plains of Bangladesh. It holds the World record for the most rainfall in a calendar month and in a year. It received 9,300 mm (366 in) in July 1861 and 26,461 mm (1,041.75 in) between 1 August 1860 and 31 July 1861. Read that the original name for Chirapunjee was Sohra, which was pronounced "Churra" by the British. This name eventually evolved into the current name, Cherrapunji. The word "cherrapunji" means 'land of oranges'. Sad to read that despite perennial rainfall, Cherrapunji faces an acute water shortage and the inhabitants often have to trek for miles to obtain potable water. Irrigation is hampered due to excessive rain washing away the topsoil. Valleys around Cherrapunji, however, are covered with lush and very diverse vegetation, containing numerous endemic species of plants, including Meghalaya subtropical forests. I have so far never heard of this place – Mawsynram ~ a village in the East Khasi Hills district of Meghalaya, 65 kilometers from Shillong. Daily Mail reports that this place is the ‘wettest place on Earth’, with an annual rainfall of 11,872 millimetres (467.4 in). Mawsynram is located at 25° 18' N, 91° 35' E, at an altitude of about 1,400 metres (4,600 ft), 16 km west of Cherrapunji, in theKhasi Hills. The name of the village contains Maw, a Khasi word meaning stone, and thus might refer to certain megaliths in the surrounding area. It is stated that Mawsynram, located about 15 km north-west of Cherrapunji is the wettest place in the world, or the place with the highest average annual rainfall. 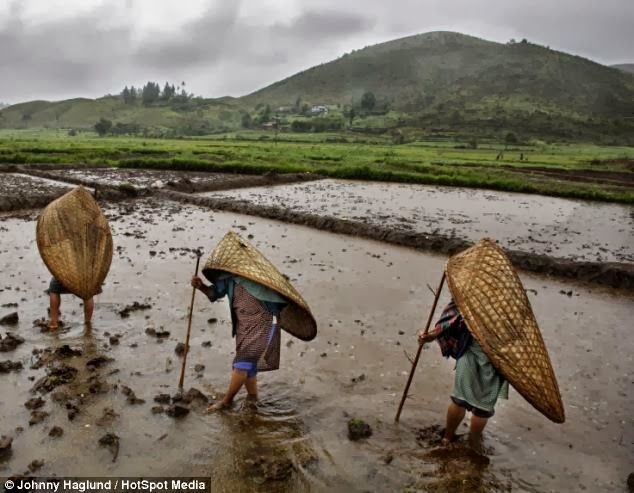 Mawsynram, receives nearly 12 m of rain in an average year, and a vast majority of it falls during the monsoon months. Here is something from the Daily Mail on the people of this Indian village who live in the wettest place in the world with 40 ft of rain a year : If the soggy start to autumn is getting you down, spare a thought for these poor souls living in the wettest place on Earth – starts the article. Torrents of water turn the streets of Mawsynram in north east India into waterfalls and the constant deluge leaves families plugging leaking homes. Power lines topple under the weight of the cascading rivers, animals seek shelter where they can and locals have learned never to leave home without a brolly. It is stated that the village which lies close to the border with Bangladesh, is battered by an average of 11,871mm, nearly 12metres, of rain a year. In a bid to shelter from the downpours villagers have even created specially made reed-turtle shell-like baskets to protect them as they work in the fields. But no-one in the mountainous village, close to the border with Bangladesh, is heard complaining as the monsoons bring a welcome boost as tourists flock to the area and the dry season leaves many facing a desperate hunt for water. 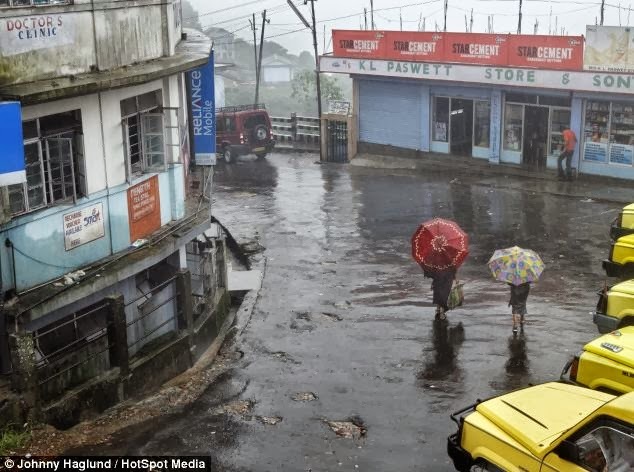 While the UK has suffered a wash out in the last week, the hapless villagers in Mawsynram cope with the chaos caused by 11metres or 467ins of rain each year - more than 20 times the average rainfall in London. ~ the neighbouring Cherrapunji - dubbed the second wettest place on earth - does not escape the violent weather. The severe downpours do provide locals with a welcome income boost as tourists flock to the area to witness the spectacle. While India's wet season runs from June to September, northern areas like Mawsynram experience an extended monsoon period. In June 1995 the village was hit by the greatest rainful in a 24-hour period when more than 5ft of rain fell. For the last few years, the streams of tourist to visit Cherrapunji and Mawsynram have increased,' 'They come here to see the rain during the wet season which gives the inhabitants a well needed extra income. 'The locals tell that the dry season is worse than the wet in many ways, because they actually have problems to find water for drinking and washing.' The area of north east India is so wet because rainclouds, which form in the summer, are trapped from escaping north into Tibet by the world's highest mountain range, the Himalayas. The violent downpours cause chaos, pulling down power lines and creating treacherous conditions on the roads. It seldom gets hot in the region with average monthly temperatures ranging from 10C in January to just over 20C in August. The noticeably drier months run from December through to February, where monthly precipitation reaches a meager 60mm. The driest place on Earth, South America's Atacana desert, fails to see even half-an-inch of rainfall each year and some parts of the desert have not seen a rain shower in the last 500 years. Elections to the Delhi State Assembly will be held on 4 December 2013; results will be out by 8th Dec. This will be one of the first five elections in which the Election Commission of India will implement a "None of the above" (NOTA) voting option, allowing the electorate to register a neutral vote but not to outright reject candidates. Dr Harsh Vardhan has been named as the Bharatiya Janata Party (BJP) chief ministerial candidate. Sure there would be a tough fight for ousting Ms Sheila Dixit ….. BSP and Communists too are in the fray… as also the ‘Aam Aadmi Party’ (translation: Common Man's Party), party formally launched on 26 November 2012 arising out differences between the founder Arvind Kejriwal and Anna Hazare on whether or not to politicise the popular India Against Corruption movement that had been demanding a Jan Lokpal Bill since 2011. Incidentally, do you know the election symbol of AAP ? Gold prices came crashing down about 6 months ago ~ but slowly have stationed themselves back where they were earlier… today 1 gram of 22 KT gold costs Rs.2949/- ; it is Rs.3153/- for 24 KT gold per gram. It is not the gold price but spiralling price of another which might have some say in the election campaign. It is that of ‘Allium cepa’ – the bulb onion that is embattling the Central Govt – not on any welfare motive but on the run up to State polls. The onion prices, defying the sharp dip in the rates in the country's biggest wholesale market at Lasalgaon in Nashik, continued to spiral and touched the Rs 100 per kg mark in the city and elsewhere making the Govt panick-stricken. Food minister K V Thomas rushed to Maharashtra as the Congress-ruled state accounts for 28% of the total onion production and can help tame prices by cracking down on hoarders. Commerce minister Anand Sharma blamed hoarders for the spike in onion prices which political rivals have painted as the UPA government's failure, and worse, insensitivity towards the poor. The Congress government in Delhi, which rode the onion anger to power in 1998, was more precise as it shifted the blame on hoarders in BJP-ruled Madhya Pradesh. Civil supplies minister Haroon Yusuf alleged that hoarders were keeping supplies from reaching Delhi to sabotage Congress's prospects in the assembly elections. But a Govt ruling at the Centre and State should have strategy and plans in place rather than simple letting out of anger. We even heard of Food Minister’s talk on banning exports ! ~ should sound only a political statement as none would send farther off when one can realize higher revenue locally. It should be other way – allowing imports from neighbouring countries……….. some agencies report that Onion supplies increased by close to 15% but still prices have not been controlled. Now they will blame the farmers for keeping their stocks expecting higher prices, when it is public knowledge that it is always the middlemen who control the market. Elsewhere, the Finance Minister P. Chidambaram on Tuesday ruled out the possibility of lifting a ban on import of gold coins and medallions and asked banks to strictly follow guidelines restricting inward shipments of the metal. “Import of gold coins and gold medallions is prohibited. Nobody can import gold coins and medallions,” he said, referring to a suggestion that the government should allow import of coins for ‘shagun’ (auspicious gift) purposes. He said traders can buy gold from the domestic market and make coins, but the government will not relax the curbs that were imposed to contain the current account deficit (CAD). High gold imports of 845 tonnes was one of the main reasons that pushed the CAD — the difference between the inflow and outflow of foreign exchange — to a record high of 4.8 per cent of GDP, or $88.2 billion, in the previous financial year. So for some it is Gold or Onions……….. the Aam Aadmi Party (AAP) is contesting the coming Delhi assembly election with "broom" as its symbol. The party said broom symbolized dignity of labour. "With broom, the party hopes to clean the filth which has permeated our government and legislature. The country needs a clean sweep of its corrupted mainstream political parties," the statement added. Sure, one may not readily identify this good looking person……. She is a Cricketer – a right handed bats(wo)man and occasional wicket keeper, who made her debut in Jan 2007, when aged 17…….. she is Mignon du Preez and in news as Cricket South Africa has offered contract to her alongwith few others for the first time in its history. Sometime back when interviewed she said : Before you read further do you know or remember the first Captain of Indian womens’ Team ? Who is your favourite cricketer, and why? : Sachin Tendulkar – Love his presence at the crease, how he always looks calm and how he structures his innings. Which international cricketer would you most liken your playing style to, and why? : Jonty Rhodes. I’m quick between the wickets and an excellent fielder. Through the increased investment of CSA's main partner, final services provider Momentum, six players are being afforded contracts. In December 2012, the sponsorship enabled CSA to employ a full-time women's coach, Hilton Moreeng. In what is seen as a major boost for the women's game, South Africa joined England, Australia, West Indies and Pakistan in centrally contracting some women's internationals. The players contracted now are : Captain Mignon du Preez, allrounders Dané van Niekerk and Marizanne Kapp, bowlers Marcia Letsoalo and Shabnim Ismail and wicketkeeper Trisha Chetty. South Africa finished in sixth place at the 2013 World Cup and recently completed a double series clean sweep over Bangladesh in One-Day Internationals and Twenty20 Internationals on home soil. There was some criticism that local English daily newspapers did not provide enough coverage recognizing the historic event in South African cricket. On 8th Oct 2013, for the first time contracts were awarded to women’s cricketers. The move by Cricket South Africa (CSA) is seen as a momentous leap for women’s sport. It is not the entire team but only 6 women but still a strong way forward. The Proteas women will take on Sri Lanka in an ODI series from 24 October 2013 and a T20 series from 31 October 2013. What used to be a sport and industry more suitable for men is changing perceptions, and South Africa seems to be setting the bar. 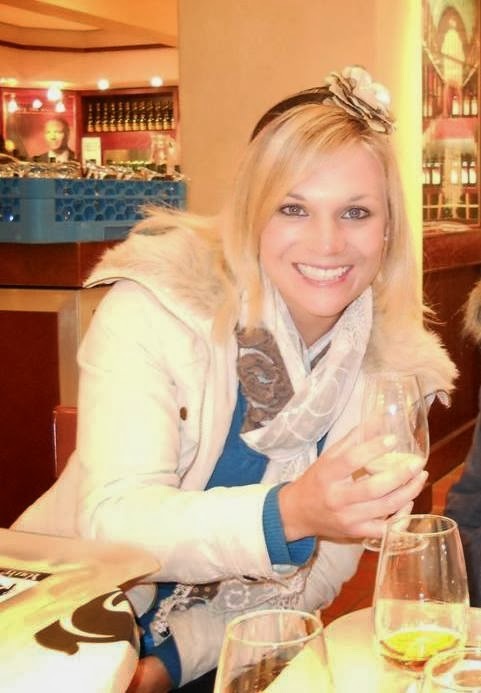 This means that players like Mignon du Preez, who scored a double century in a 40-over game as a 12-year-old, can now focus on just playing cricket instead of having to find a job which will allow her to sneak away for training. Getting back to the Q at the start ~ it was the tall Shanta Rangaswamy who captained India in its first Test against West Indies in 1976. Incidentally, the first woman Captain of Indian team in ODI was Diana Edulji – Shanta was the 2nd. About a year ago, there was news that ace Indian shooter Jaspal Rana was appointed chief coach for junior pistol shooters by the National Rifle Association of India (NRAI) and becoming entitled to get a monthly salary of INR 50,000. Cricket Board is much rich and they pay huge foreign currency to Duncan Fletcher ~ the way they did to Gary Kirsten, Greg Chappell and more…Duncan Fletcher who looks so serious on screen is reportedly paid princely 34 lakhs + per month. We are seeing the bowling cupboard barren with opponents scoring runs heavily – death bowling is mere surrender making Harsha Bhogle remark that Dhoni should search for a death-bowler in some reality show. With this background, one must remember that payment to players is regulated under an annual contract by the BCCI and that players would continue to get their remuneration irrespective of the fact whether they play in the XI or part of the squad or not !!! There are grades A, B & C - last year with the changes made by the BCCI - Offspinner Harbhajan Singh and seamer Ishant Sharma were demoted from Grade A to B; while offspinner R Ashwin was promoted from Grade B to A. That meant that the duo of Harbhajan and Ishant will draw a fixed income of Rs 50 lakh (approx $93,000) each from October 2012 to September 2013, instead of the Rs 1 crore (approx $186,000) that players with the top grade of contracts will get. There is lot of money - big money associated with Cricket and that partially explains the way players perform… the whole World – more of those who do not like Cricket tended to equate IPL with a villain – criticizing IPL is all about money – it did appear that everyone connected with IPL were basking in money. One would be startled to know that Sunil Gavaskar and Ravi Shastri who earn as commentators also are paid by BCCI also for not commenting anything against the policies of the rich Board. From idyllic settings to boiling cauldron to serving the Nation – Kudankulam has seen it all……. Half a century ago, this place lying in Tirunelveli district was an obscure place, not known to the rest of India. It gained prominence after the Nuclear Power station - Koodankulam Nuclear Power Plant (KKNPP) coming up over there. A Plant of such strategic importance and magnitude did not spring up overnight. It was signed by the then PM Rajiv Gandhi and Soviet President Mikhail Gorbachev on November 20, 1988 after being conceived in mid 1980s. In July 2013, came the good news of the country’s first 1,000 MW pressurised water reactor at Kundankulam in Tamil Nadu attaining criticality. Now more happy news with the news of the first 1,000-MWe unit of the Kudankulam Nuclear Power Project, now but one stage away from commission, and on Tuesday it getting synchronised with the southern regional grid. Initially, at 2.45 a.m., the first reactor generated 75MWe and gradually notched up 160 MWe. Subsequently, it was successfully transmitted to the southern grid at Abhishekapatti on the outskirts of Tirunelveli after the KKNNP project authorities got the ‘connecting password’ from Bangalore. The Hindu reports that the process was halted at 5.15 a.m. so engineers could study the behaviour of the reactor’s ‘integrated systems’, the turbine and the generator — a routine procedure. “The power will be further raised to 500 MWe, 750 MWe and 1,000 MWe in stages. At every stage, various tests are conducted and the technical parameters verified. Based on the results of the tests at each stage and with AERB [Atomic Energy Regulatory Board] clearances, subsequent stages are reached,” said a press release issued by Site Director, KKNPP, R.S. Sundar. “Though the reactor will continue to generate steam, the turbine will not be allowed to function as it has been stopped [to enable engineers] to study its performance during and after synchronisation. The functioning of the valves and the pipelines connected to the turbine is being evaluated. Moreover, the functioning of the generator is also being reviewed. All these tests and readings are being submitted to the AERB online and clearances being obtained then and there. So far, every part of the reactor, turbine and generator has performed extremely well. We are very much satisfied,” Mr. Sundar told The Hindu. KKNPP sources said the southern grid would get 500 MWe from the first reactor before this weekend. So from 1988 to date providing energy succour, Kudankulam has come a long way indeed ~ amidst protests by groups of people, supported by some sinister designs. The first reactor, which attained criticality at 11.50 p.m. on July 13, was expected to attain its full generation capacity by the end of October. However, fine-tuning of the Russian-origin components delayed commencement of power-generation. Now on, Tamil Nadu will generate 1,440 MW of nuclear power, the most in the country, and the beginning has been made now. Tamil Nadu is the first state to have nuclear power plants in two places — Kalpakkam and Kudankulam. Tamil Nadu will displace Maharashtra, which has four reactors with a total capacity of 1,400MW, from the top spot. Other states with significant nuclear power capacity are Rajasthan with six reactors capable of generating 1,180MW, and Karnataka with four reactors with a total capacity of 880MW. Uttar Pradesh and Gujarat each have two reactors of 880MW. With Kudankulam, India will increase its nuclear power capacity to 5,780MW from 4,780MW. TOi reports that as per the original agreement between the beneficiaries of Tamil Nadu, Karnataka, Kerala and Puducherry, Nuclear Power Corporation was to sell the power at Rs 3.50 per unit. “We are planning to revise the price at which the power will be sold,” said Kudankulam Nuclear Power Project site director R S Sundar. More than Kudankulam, some newspapers have been devoting more space for the orchestrated protests from Idinthiakarai…. 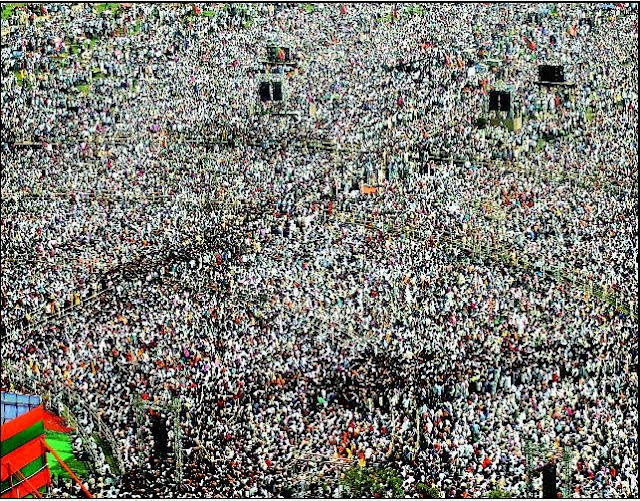 As one could recall, the agitations at some point turned violent too…….. betraying the inherent contradictions of a “peaceful” “Gandhian” movement that the anti-Kudankulam agitation claimed itself to be. The agitation in between changed colours and a 4000-strong group of people moved towards the plant threatening to disrupt its activity, preventing engineers from going in and some had the audacity to question the knowledge and understanding of honourable APJ asking whether he was a nuclear scientists ~ the Questioners had no knowledge of Nuke was conveniently forgotten. Their protests have been prominently covered by some newspapers ~ and many people know it all………. Nation is happy that it is functional and the first current is energizing the Nation.